My date of departure is one week from today. Sunday, August 8, 2010. Who believes it? Not me. As many of you know, this whole thing began as a fleeting thought last Fall as a result of my untenable work situation and an inability to find an inspiring form of employment to replace it. You’ll please remember that I had never even spent a night in an RV when this idea took hold. One thing led to another and looking back, I am amazed by how smoothly everything went. I mean, you’d think quitting your job and turning your life upside down and backwards would create a few waves or stress or panic attacks or hair loss or great bouts of doubt or something! Not in this case I am happy to say. Everything from selling most all my worldly possessions, to fixing up my house for sale or rent, to finding long-term reliable tenants, to moving from a 1800 sq ft home into a 280 sq ft home on wheels, to quitting my job, to learning about the full-time RV life, to finding and buying and RV, to learning to operate the RV systems (I’m sure you remember the “dreaded systems”), to drive and back up and park an RV, to on and on and on went off without the slightest hitch. And here we are, one week to the day before my life on the road begins. For the entire Summer I have been looking for a tow car. A car which I can tow behind Dora because my current Toyota 4 Runner is not towable with 4 wheels down. Just last week, I found a Toyota Matrix which I promptly named Lil’ Pea and ordered the appropriate hitch, base plate, braking system, and rock protection device most of which arrived a few days ago. I have appointments on Tuesday and Wednesday to have all this installed on Dora and Lil’ Pea, which should give me a few days to learn how to hitch and unhitch Lil’ Pea and to drive and park while towing a car. Then its off to Tok, AK on Sunday, my first day living a life on the road. 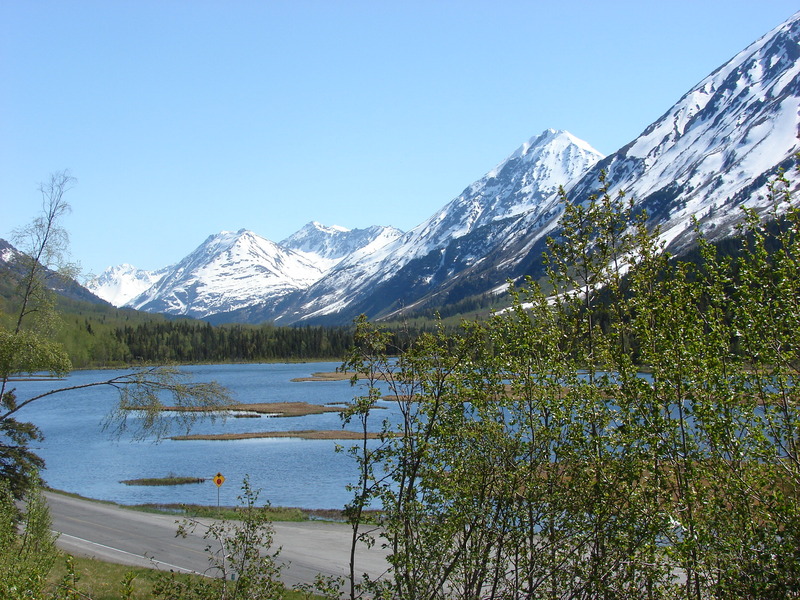 I’ve added a new page to AlaskaMarge Travels. It’s a map page called, Route Map. If you go there, you will see a Google Map on which I have outlined my proposed route from Anchorage, AK to Asheville, NC. This route is over 5,000 miles long and is, of course, subject to change at any time with or without notice, but hopefully I’ll be able to keep it up to date with my actual route, current location, and pinpoints of places of interest along the way. I’ve also updated the, About Dora page by adding a floor plan and a photo of Lil’ Pea. In addition, I added a couple of photos of Dora alternatives or Dora “could have beens”, as well as a photo of my new mascot so take a look. I know folks like to see pictures, so I’ve added a couple of random shots taken over the past few weeks. 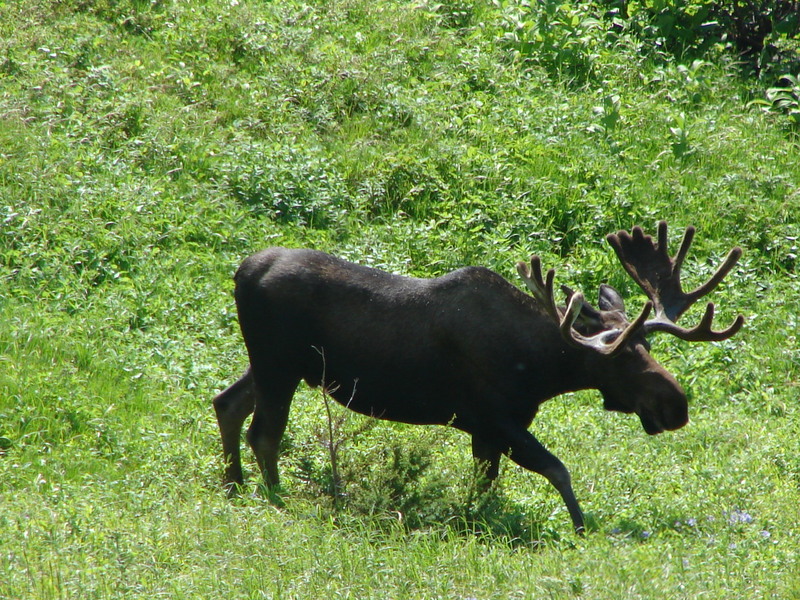 The first one is of a large bull moose I ran into while hiking. I was glad he showed more interest in eating than in me. And this next one is of a major highway intersection on the Kenai Peninsula. Beautiful isn’t it? Margie!!! I envy you in many ways and I can’t wait to follow your adventures. You are doing stuff I don’t know that I’d have the guts to but think would be an awesome experience. I’m totally psyched that you are headed this way and I hope you will come visit me and Alan in Waynesville and let me make you a nice dinner. There are a ton of RV parks within 5 miles of us on Jonathan Creek Road. You rock girl! Have fun and be safe! Thanks Hoover!!! Looking forward to seeing you as I do think my route will take me right by Waynesville. Can’t wait to see your new mountain digs!